Posted November 7, 2016 by Charles Morris & filed under Newswire, The Infrastructure. 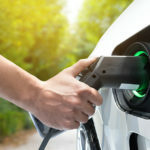 EV Connect also recently inked a similar agreement with the New York State Energy Research and Development Authority (NYSERDA). New York’s Charge NY Initiative aims to create a statewide network of up to 3,000 charging stations by 2018. Do they have any group to monitor if they are working and providing the correct amount of power for the correct price? In Arizona they vary and we have a lot that don’t work. No one monitors these like they do for a gas pump and some really over charge in $ for their power. The 200-mile EV Paradigm doesn’t need that many level 2 chargers and more DC fast charging of 150kWh level and higher. We only need one DC fast charging standard too. One Charger to Rule them All. There should be 400 just in parking garages in Manhattan! 400 for the entire state? Really? Well, I guess it is a start.